The current trend for constructing experimental structures is now an international phenomenon. It has been taken up worldwide by design professionals, researchers, educators and students alike. There exist, however, distinct and significant tendencies within this development that require further investigation. This issue of AD takes on this task by examining one of the most promising trajectories in this area, the rise of intensely local architectures. In his seminal essay of 1983, Kenneth Frampton redefined Critical Regionalism by calling for an intensely local approach to architectural design. Today, Frampton’s legacy is regaining relevance for a specific body of work in practice and education focused on the construction of experimental structures. Could this ultimately provide the seeds for a compelling and alternative approach to sustainable design? Contributors include: Barbara Ascher, Peter Buchanan, Karl Otto Ellefsen, David Jolly Monge, Lisbet Harboe, David Leatherbarrow, Areti Markopoulou, Philip Nobel, Rodrigo Rubio, Søren S Sørensen, Defne Sunguroðlu Hensel. Featured practices: Renzo Piano Building Workshop, Rintala Eggertsson, SHoP, Studio Mumbai, TYIN tegnestue. Michael Hensel is an architect, researcher and writer. He is Professor for architecture at the Oslo School of Architecture and Design (AHO), where he directs the Research Centre for Architecture and Tectonics (RCAT). Previously he taught at the Architectural Association School of Architecture in London (1993-2009), where he developed the curriculum and co-directed the Emergent Technologies and Design Program (2001-2009). He has held visiting professorships and innovation fellowships and taught and lectured in Europe, the Americas, Asia and Australia. He is founding member of OCEAN (1994). He is founding and current chairman of the OCEAN Design Research Association and the Sustainable Environment Association (SEA). He has written extensively on architecture. He has guest-edited 5 ADs and is on the editorial board. 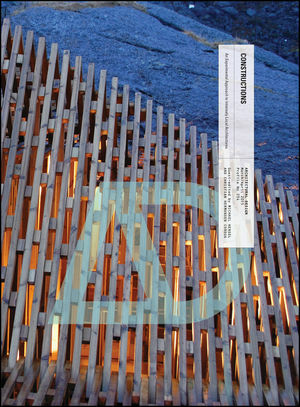 Christian Hermansen Cordua is a professor at the Oslo School of Architecture and Design (AHO) and formerly Head of the Department of Architecture (2004-9). He has taught internationally and in 2010 he spent a semester as visiting researcher at the LSE, Cities Programme.. He has published several books and contributed to journals, books and exhibitions in Europe and America. In recent years he has held several European Union funded research projects. E-archidoct, which ended in 2010, and currently: HERA, Scarcity and Creativity in the Built Environment (2010-1013) and Erasmus Mundus Latin America Project (2012-2015).